Pacific Enamelware Factory was one of the leading enamelware manufacturers in Hong Kong in the 1950s-60s before its closure in 1970. The firm was a partnership between Chua Kian-bun (蔡建文, 1898-1983), a prominent Fukienese businessman with business interests across Southeast Asia and K.Y. Chang (張國英) andH.C. Tsao (曹希祥, former factory manager of Hip Dah Enamelware Factory 協大搪瓷廠), two veterans of the enamelware industry in Shanghai who were co-founders of Shun Feng Enamelware (順風琺瑯廠) in Shanghai in 1946. The owner of the HK Pacific Trading Co Ltd (太平洋貿易有限公司) in Hong Kong, Chua went to the Philippines at an early age where he made his fortune in trading. In 1939, he closed downhis Philippines operations and moved to Shanghai where he established a lumber firm with operations in Foochow. 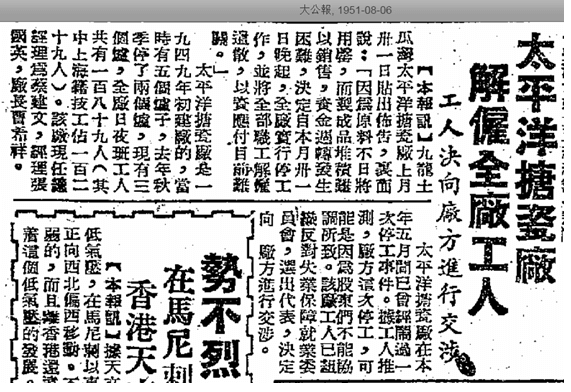 In 1948, Chua relocated to HK as his business in the mainland was suspended due to losses associated with natural (flood) and man-made disasters (hyperinflation, Civil War). There he started Pacific Enamelware with workers from Shanghai but soon ran into trouble and had to lay off all workers in mid-February 1949, with severance pay of 1 month and 22 days and ship tickets to Shanghai for workers who chose to return. Salvation came in the form of Chang and Tsao, who became new shareholders of Pacific in March 1949 and brought with them most of Shun Feng’s cash and inventories and 50 skilled workers from Shanghai. 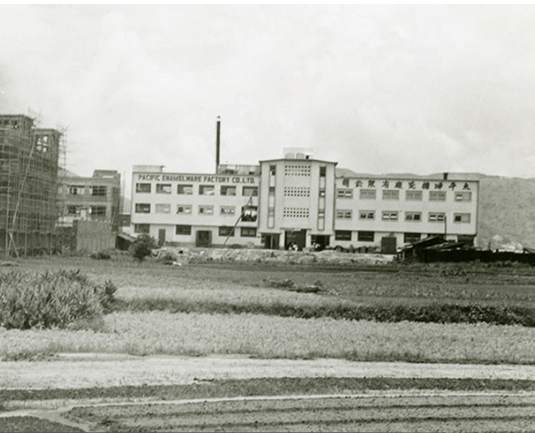 The firm was incorporated in December 1949 with Chua as managing director, Chang as manager and Tsao as factory manager. The plant, which was located 1 Ha Heung Road in To Kwa Wan, had 5 kilns and employed 189 workers by 1951 (of which 129 were Shanghainese). Business remained challenging in the early 1950s as the factory closed two of its kiln in the autumn of 1950 and in august 1951 announced layoffs of all of its workers. Somehow Pacific survived and thrived and a bigger plant was built in Tsuen Wan in the late 1950s. Chua also found success with HK-Pacific Trading which was involved in import and export of fabrics, textiles and metals in Southeast Asia (especially exports of textiles to Indonesia in its early years) and diversified his business interests to gourmet powder, textiles, garment and construction. 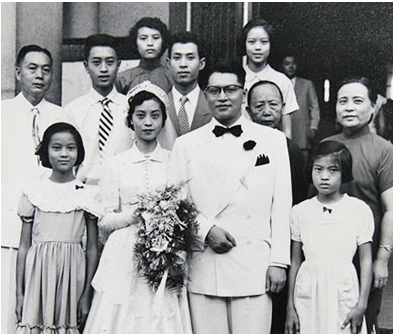 Chua Kian-bun (first from left) and his family at his daughter’s wedding to Ting Cheng-tsung (aka KittiSriyuksiri), who worked for Pacific Enamelware as chief accountant in HK before building his textile empire in Thailand. Chua and his wifeGo Siok-chinghad 10 children. His eldest son TaweeChaichirabun (蔡志偉, aka Chua Chee-wee, 1928-), his second daughterSarinthornSriyuksiri (aka Peggy Tsai Yuet-see 蔡悦诗, 1927-2008) and her husband KittiSriyuksiri (丁政曾, 1925-1999) all worked for Pacific Enamelware in HK before moving to Thailand in the early 1960s where they built a textile empire which included companies such as the listed Hua Thai Manufacturing PCL and Microfiber Industries Ltd. The family has donated over RMB45 million to various charities in China over the years and Chua Kian-bun was a benefactor of Po Leung Kuk and many other charities in HK before his death in 1983. By 1970, it was no longer competitive to produce enamelware in Hong Kong and many factories had relocated its production to lower cost locations such as Africa, Indonesia and Singapore.That same year, Pacific Enamelware decided to shut down its factory in HK and laid off its remaining 23 staff, many of whom started working for the firm in Shanghai. As a firm, Pacific Enamelware was dissolved in 1975. While Pacific Enamelware faded away from the HK industrial scene, KY Chang’s son Dr C.C. Chang (Chang Chu-cheng, 張樹成), a CUHK physics professor turned entrepreneur as the co-founder of Varitronix in 1978 with Dr. York Liao actually put Hong Kong on the map in the liquid crystal display industry and the betting machine it developed for the Jockey Club actually made its way into the Computer Museum in the US. This article was first posted on 30th July 2018.